Five years ago to the day I set up my Gmail account. The first email in my Inbox was of course from Google welcoming me to Gmail. 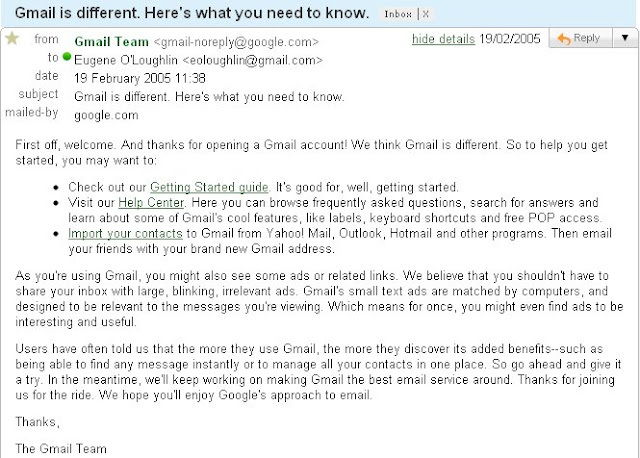 Google claimed Gmail is different, but I believe that it is now a standard for personal email. In that first email, Google tells me about ads and cheekily state that I "might even find ads to be interesting and useful"! I use Gmail almost every day - mostly for personal stuff. It is a handy way to store files (I just email them to myself). I can also access it from home and my iPhone - in fact I almost never don't have access to my Gmail. I choose not to access my work email outside the College. Gmail is also excellent at stopping Spam - as I write this there are 678 spams blocked on my account. I rarely get spam in my Gmail Inbox (this is not rare at my work email). However they do it, others should learn from them. Also at the moment I am "currently using 910MB (12%) of your 7425MB" - so there is lots of space online that I can use. This is a fantastic service and it is all FREE!!! I also use iGoogle, Google Calendar, YouTube (owned by Google), and Blogger (also owned by Google). All for FREE!!! Long Live Google! Eugene, you're not leaving us to work for Google are you? !